Percutaneous laser decompression (PLDD) - a gentle method of treatment of various diseases of the spine in Germany related to violation of the functionality of the intervertebral discs. 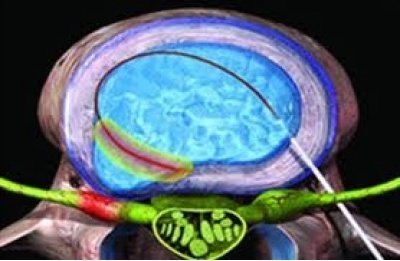 The specialists of the thinnest flexible fiber injected into the spinal canal microlaser using punctuation needle. All this takes place under control of a microscopic endoscope with a camera on the end. The image is transferred to the screen in real time. Action modern laser energy to reduce in size of the disk ( or vaporize wrinkle ) and thus achieve the reduction of herniated discs, if it already exists and, accordingly, to achieve reduction of pressure on the surrounding tissue. This palpable relief. Furthermore, under the influence of the laser is restored cartilage collagen, whereby small cracks existing on the surface thereof, are closed and recovered. Immediately after the procedure, the patient can get up on your feet and within a few hours to leave the clinic.